This is the beginning of the creation of new characters for the storyline in this account. The head is started from a small wooded ball. A snout is shaped from styrofoam epoxied onto the ball. Then it is molded over using plumbers putty. That is the point where the eyes, ears and other details are made. Then it is painted with craft paint. Shown in the pics are the bodies drawn on paint program, which is not the final product. That is for the purpose of making hard copy photos from. Then xerox copies will be made of the photos at the right size to where the heads on the copies are the exact size of the actual figurine heads. The xerox copies will be used as a guide for the proportion of the bodies. It is easier to adjust and change in order to get the proportions right on a computer than it is to do that during actual working of the art materials. These figurines will be in sections linked together with beaded pull chain to act as joints. 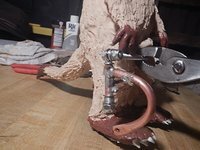 When they get used as a drawing guide for a posting, artist clay will be molded around pull chain to form up a full body appearance. That way, they can be posed. Play-doh will not be used as it is too soft. Oil base art clay is stronger. These will not be the fake fur covered figurines with regular joints as these are a lot smaller in actual size. 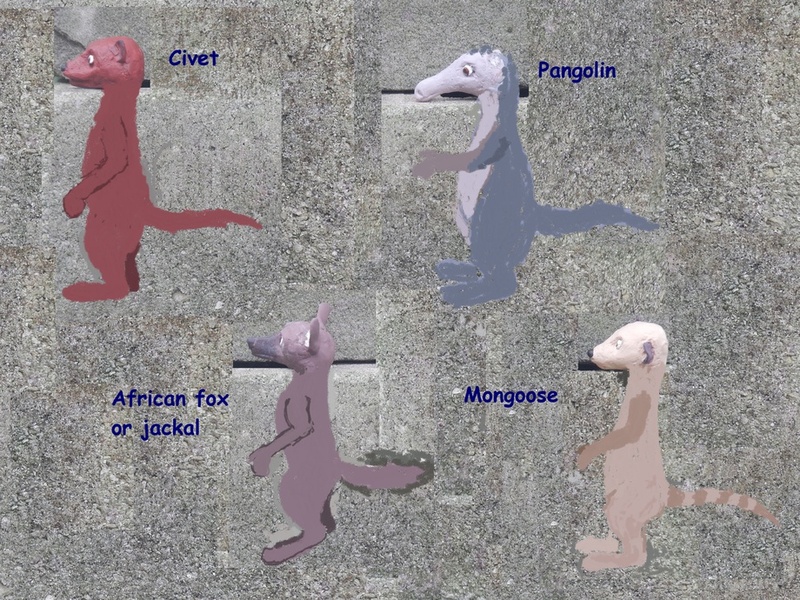 At a later time, I will also make some of the larger fake fur covered figurines of some of the characters with permanently covered joints. Those are made very much like the figurines were made for the cartoon, Fantastic Mr. Fox. Here, a typical joint is shown for that kind of figurine. The figurine shown next to it is a non-movable. Being this is a "how to do" explanation of some of my methods, this posting will be moved to the scraps gallery within a few days. when are you going to get around to to some avians, insects, lizards, amphibians, fish, non-vertebraes or anything, really? Or is this an all-mammal utopia like zootopia... or that all-arian dream Hitler had? All my characters had typically been mammals. Sometime in the future, it is likely I will have something with a dragon in it. 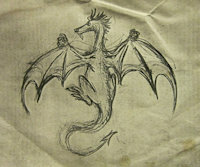 I did have some dragon characters in an old story that was lost before there were any internet artsites.